Keep love connections strong all across the country with this cleverly designed clock. 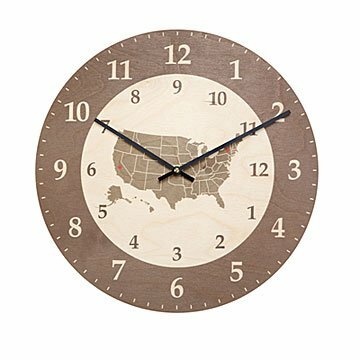 Because love knows no bounds—or time zones—this wooden clock is ideal for those who call two places home, or for people with loved ones living miles away. The outer circle represents the time at home, and the inner circle represents another time zone of your choice. The centerpiece of the design is a map in the middle, which is personalized with hearts marking two meaningful places. Whether you're giving the long-distance relationship thing a shot or you're looking to keep up with grandkids across the country, this clock is a clever way to maintain all kinds of love connections. Imported wood. Wood pieces cut, printed, and assembled in Charlottesville, Virginia. Want to give this as a gift but don't have all the information? Select "Gift Now Personalize Later" in the drop down. We'll mail you a gift card with instructions for customizing this clock.